Mary Melinda Leyshon, known to her friends as "Millie" and to many of my friends as "Gareth's Nan", passed away from this life around 3.30 p.m. today, Tuesday 8th September 2009, after a week in hospital. I take comfort in the fact that she died on the day on which the Catholic Church marks the birth of another Mother Mary, and that her death took place during the 3 o'clock hour called the Hour of Great Mercy. I know that many friends have been praying in recent days and I thank you all for that spiritual support. Born in 1914, Nan lived the greater part of her life before I was born. In my childhood, she travelled widely to relatives in Hawaii, North America, New Zealand and Australia. When I was a very young child, she and my parents (and her husband, who died soon afterwards) bough a house together, so Nan has always been part of my home. To me she was a "second mother", always there to read a story or cook a meal. In her last years, when she could no longer travel, her fame spread in another way: To many of my friends, "Gareth's Nan" was an institution, the one who provided me with brightly coloured jumpers, and guests to the family home with sumptious cooked breakfasts or hand-cooked chips. Nan had been quite deaf for many years and a family joke was to offer "Half past three" as the answer to any random question. Perhaps it was Nan's little joke in return to leave us at just about that time. I loved her very much and will miss her greatly. 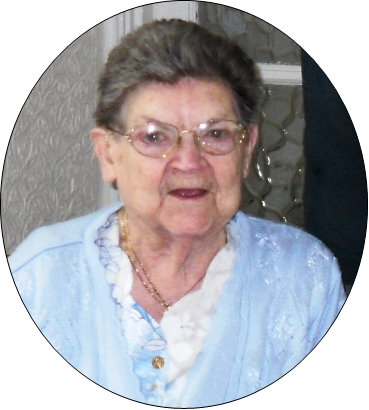 I am proud to have known her and to have enjoyed such a wonderful Nan for so long.